The Furniture Gallery of Baudette, Inc. (located in the old Lake of the Woods County school building) opened its doors in May, 1998 by CEO Gary A. Larson and co-owner/manager, Pam Larson. Having resided in Baudette most of their lives, both Gary and Pam have a love and passion for the Far North lifestyle - enjoying the bountiful benefits of living in Lake of the Woods County - such as boating and fishing on one of the largest lakes in the country, snowmobiling and ice-fishing in the winter, among many other local and wilderness activities. Gary's real day job keeps him busy as a local builder-contractor, and the sole owner of Baudette Builders Inc. He has been building residential and lake homes, cabins, commercial buildings and working on many large to small remodeling projects for over 3 decades. After high-school, Pam spent 17 years in S.W. Florida, Pam studied and earned her Interior Design license. She has extensive experience working with clients from all over the world, and has used her design skills and talent to decorate and set up many residential and vacation homes, as well as office and commercial settings. While in Florida, she also worked with local builders and contractors in decorating and setting up thier model homes for show and sale. 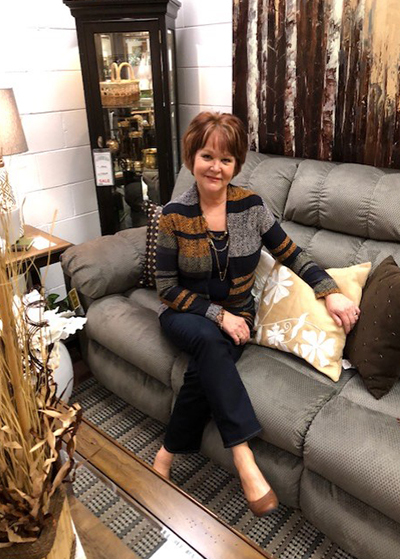 Pam carried this knowledge and experience with her when she returned to Baudette to open and manage The Furniture Gallery with Gary. She loves design and decorating and is happy to offer her professional expertise to each of her customers. The northland's best kept secret. It only seems right that the more you buy, the better the price and the more you save. We offer FREE delivery and set up and, Free removal of old furniture within a 70 mile radius.